Native from the California area of the North American Continent, the Firefox (as it is normally called) is a direct descendant of the Netscape Navigator, a recently extinct species of browser. Although it preceded Chrome by some years, having been forced to adapt, Firefox managed to mimic some of Chrome's most adaptable features. Today it is highly regarded and has found a home on a fifth of the world's computers, partly because of its cute logo but also because of security advantages. Although it does not pride itself with speed (I honestly have not spotted a significant difference between it and Google Chrome), Firefox is set up to be a robust browser that satisfies the needs of today's user. Starting with the tab management, Firefox uses the drag and drop method to rearrange tabs and move them into or out of the window, creating a new one. It also offers private windows that do not record any activity and behave as a separate Firefox tab group. As for user adaptability, although it does not perform searches while you are typing in the address bar, it treats them a bit differently and that is not necessarily a bad thing. Entering search words will eventually initiate a Google search. Alternatively, you also have a small search bar that can perform searches on specific search engines such as Bing, Wikipedia, Amazon or Twitter. This list can be expanded and customized. The interface is essentially a free canvas. You can add, remove and rearrange buttons on the main toolbar or on the drop down menu in any configuration. You cannot get creative however. Spreading buttons all over the screen is not possible and highly forbidden. Besides that Firefox is also employing some nice touches. For example, after re-opening a closed session, there is a default options that prevents all of the tabs from refreshing simultaneously. This can be turned off however. It can also block pop-up windows without the need of a third party software. It allows you to edit file associations and can set-up a master password. This last option is very handy if you do not want to auto-log into e-mail or social account but still want easy access into each. Synchronization is an aspect that a Google user takes for granted. In this respect Mozilla has created the Firefox Sync feature. 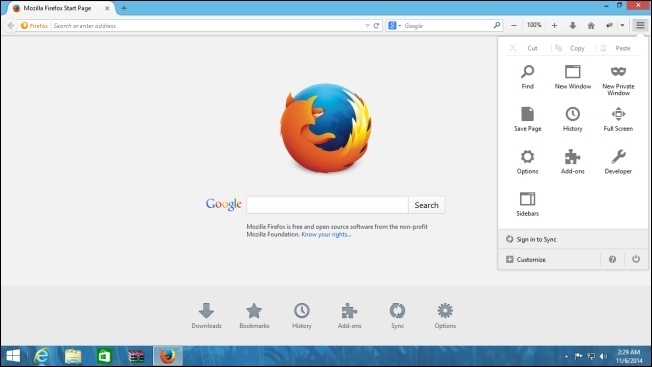 You can log into Firefox on any computer or device and have access to bookmarks, passwords and even active tabs. Oh, The add-on market! 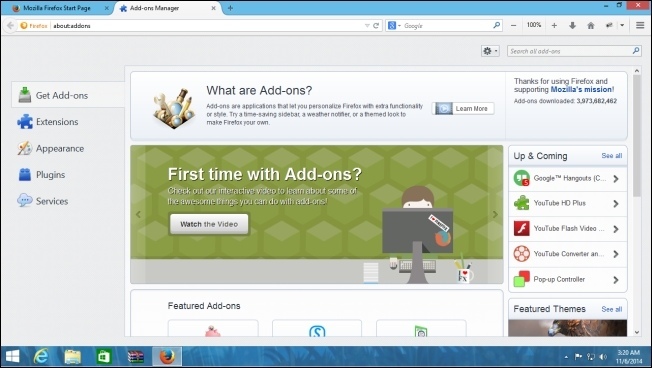 Firefox can be improved with many functions and additions. For example, Web of Trust is a community based security tool that blocks access to malicious or suspicious sites (with the user's consent, of course). Firefox is being developed as a work of love for humanity. No wonder it comes pre-installed on Ubuntu Linux (and nobody ever complained about it). Either you prefer it for its style or don't want to give in to the dark si... ahem! I mean, you prefer it to Chrome.